Trego sent this sketch to General W. W. H. Davis along with a detailed letter in 1898 as he began working on the composition for the painting. The notations on the sketch correspond to comments and questions in the letter to Davis. “I send you these sketches in order that you may show them to the veterans . . . and thereby get any information by criticism that will assist me,” he wrote. Among other things, he asked Davis: “Did the enemy come close enough for the men in your front rank to see their hands? . . . Is the regimental flag in sketch #1 too far from the fence[?] . . . Where were the Captain and the Lieutenant of Co. C. at the time the flag was rescued? Had they fallen back with the company or were they wounded or killed or still within the limits of the picture and alive?” (William T. Trego to General W.W.H. 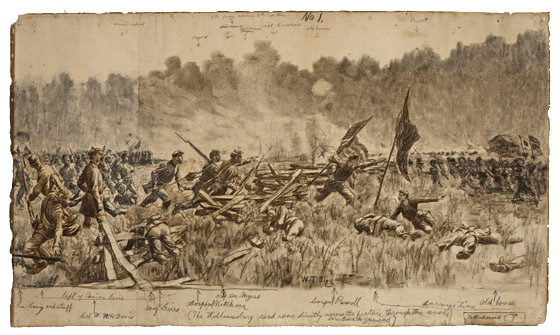 Davis, 1 September 1898, Folio 14, Davis Papers, Spruance Library, BCHS) It is clear that his goal was never just to evoke the spirit of an event but to reconstruct it as closely as possible and give the viewer a sense of immediacy, as though he or she were actually an eye witness to the spectacle. Thus, no detail was unimportant. Sent by the artist to General W. W. H. Davis, founder of the Bucks County Historical Society, when he commissioned the painting, The Rescue of the Colors. It has been in the BCHS collection ever since. A print of this sketch had been produced by the American Print Gallery in cooperation with the Mercer Museum of the Bucks County Historical Society. The sketch is in good condition.